Welcome to the ClearCreek Disposal web site. ClearCreek Disposal is a locally owned and operated trash collection and disposal service for the Blue Ridge/Happy Jack, AZ area. We offer residential trash collection service as well as 20 yard roll off containers for construction clean-up. ClearCreek Disposal provides a variety of services including Residential, Commercial, Special Event, Yard Debris and Rubbish Hauling Services. We have 20 yard roll-off containers for construction clean-up or other large clean-up projects. Residential Services - Got Trash? We can provide you with a 90 gallon trash container for once a week pick up at your home. Infrequent users have an option to purchase their own container of 33 gallons less and put out trash on a irregular schedule. Construction Debris Services - 20 yard roll-off dumpsters for construction and remodeling are available year around to provide debris removal from your project. Commercial Services - Commercial service is available to your business or subdivision in the Happy Jack Area. Small or large we are able to provide 90 gallon trash containers up to 3 yard dumpsters. Special Events - Are you planning a family reunion or group camping experience with 300 of your closest friends? We can provide trash service and potable water at your main campsite. Yard Debris - Do you have an overgrown lot that needs a little clearing of vegetation? We can provide a 20 yard roll-off dumpster to your lot. You fill it and we will take it away and dump it. One 20 yard dumpster will hold approximately 8 to 10 pickup truck loads of tree slash. Saves you a lot of time and gas driving back and forth to the slash pit. Rubbish and Large Item Hauling - Is your shed in danger of bursting if you try to stuff one more box of unused clothing or outgrown child's bike in it? Getting tired of working around that busted dishwasher or clothes dryer you keep wishing would disappear? Call us, we can get rid of it for you. Drinking Water - We can deliver drinking water to your cabin, your special event or anywhere else you might need it. We have several different sized tanks to suit your needs, 150 gallons to 1600 gallons. Please call for rates. 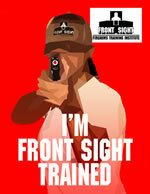 Get a taste of Front Sight - Dry Practice Training. Chose to either watch a video in your own home or come to a class hosted by a Front Sight Ambassador located near you. This is an introductory course in gun handling and dry practice for those who may be new to firearms, or thinking of purchasing your first handgun, maybe just rusty and in need of a refresher. This class will cover the information you would receive in the first day of the Defensive Handgun course at Front Sight Nevada. Click here for the website or call Catherine Yost (Front Sight Ambassador #A86629) @ 928-477-2477 for more information.